Another dud. Granted, a cannibal movie isn't for most audiences to begin with. The number of people with a morbid interest in seeing one human being graphically killed and devoured by another isn't particularly big. Of course, horror afficionados are the target audience here, but they too won't like what they see. 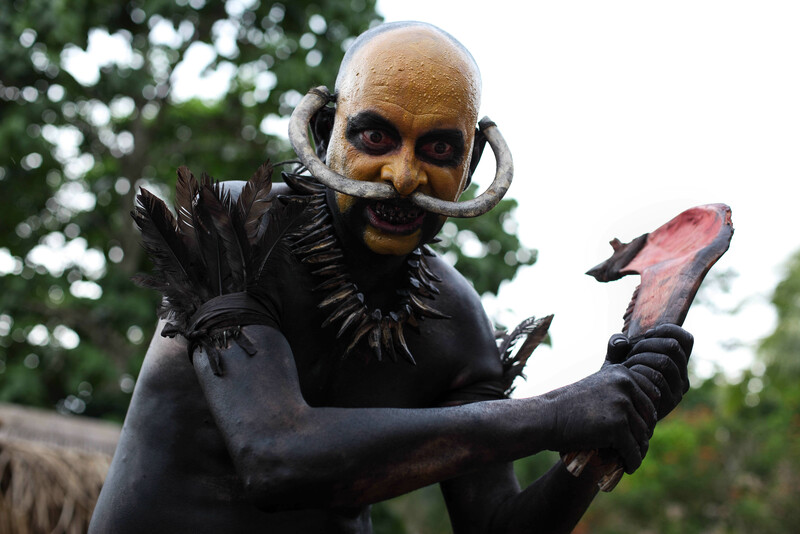 For a movie that claims to want a return to the gore and social commentary of the Italian cannibal movies of the Seventies and Eighties, there simply isn't a lot of cannibalism in The Green Inferno. Number of people brutally murdered, cut to pieces and ingested, spoilers! : just one. A good fifty minutes into the film, which only lasts just over ninety to begin with. But at least it's a particularly gory death that feels indeed strongly reminiscent to those old movies this movie is inspired by, like the infamous Cannibal Holocaust. Unlike most other deaths in the film, which are generally caused by arrows shot through the neck. But what of the social commentary on the appetite of the mass media, which also formed a strong ingredient back in the old days of cannibal gonzo? Problem is, the movies of the present day simply aren't as bloodthirsty as those in the early Eighties (unlike television, but that's another matter entirely). Sure, there's still plenty of gore in horror movies, but as graphic as the original cannibal movies? Not to mention acts of genuine animal cruelty are (fortunately!) outlawed today. So in The Green Inferno it's social media that is critiqued, rather than the violence in fellow contemporary movies and the audience's desire for ever more murderous thrills. The use of mobile phones and live streaming employed by naive activists that think their actions can actually change anything in the Third World where corrupt government officials and big corporations break their own laws for profit every day, backed by private militias. Activism via social media is no good in such scenarios, says director Eli Roth. Such comments on the use and abuse of the media are as far as The Green Inferno goes, before Roth finds it necessary to take a stand against female genital mutilation. A noble endeavour, but considering such acts are hardly practized in the Amazon rainforest, it feels awkwardly out of place, just an added sensational bodily horror show detracting from the actual cannibalism. As if eating people isn't horrific enough. 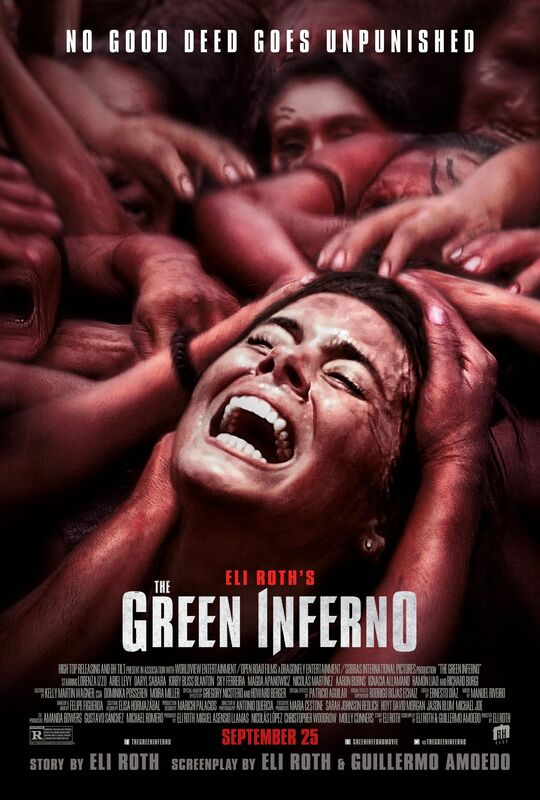 It certainly isn't in The Green Inferno. This is not a cannibal movie like its predecessors, it's a mixed bag that just happens to have a few acts of cannibalism in it. And it's a boring bag at that, with annoying cardboard characters you want to see chopped to bits but which you are denied to see die those expected brutal deaths (except for that one guy). Horror fans will be bored, while the rest of the audience won't bother anyway. If Roth thinks cannibal movies will return thanks to this flick, he's mistaken, his less than subtle hint at a sequel notwithstanding. Considering the movie had a hard time finding distributors and was shelved for the better part of two years before its release, tells you cannibal films are likely a thing of the past, and probably for the better.